First, you're in the right spot. We offer a football pathway beginning with K-2nd grades (skills development) leading all the way up to middle school school. 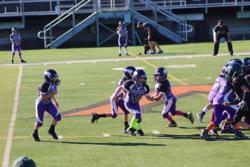 Interested in becoming a sponsor of Norwalk Football League? Whether it's our free internet banking, checking or savings accounts, our low mortgage rates, our wide array of consumer, commercial and agricultural loan products or our full service investment center - we are confident City State Bank will more than satisfy your family's and business banking needs. Home of Norwalk Warrior Apparel, Custom Apparel and Embroidery for Norwalk and the surrounding communities. The purpose of NABC is to assist in the funding of Middle School and High School athletics/activities which includes the purchasing of uniforms and equipment for over 21 different programs. Funding for this mission is obtained through memberships, concessions, benefits, and tournament sponsorships. Your membership and volunteerism in this vital funding organization is essential to its success. Become a member and get involved in this important component of Norwalk athletics and activities.